Who even has his own blog and has done a photo shoot. He was immensely fun to play with, perchance for onry-ness, and good to take on a long walk. If you want to practice for kids – get a dog, or do some dog sitting to appreciate the life-changing events that surround having extra little feet in the house. If you’ve never played actual D&D, the guys from Penny-arcade have been putting up podcasts of them playing the new 4th edition rules with Wil Wheaton. Love those little programming demo competitions – but hate downloading programs and trying to get them to run? Just watch them! And Rules for my Unborn Son – a collection of submitted wisdom for males. 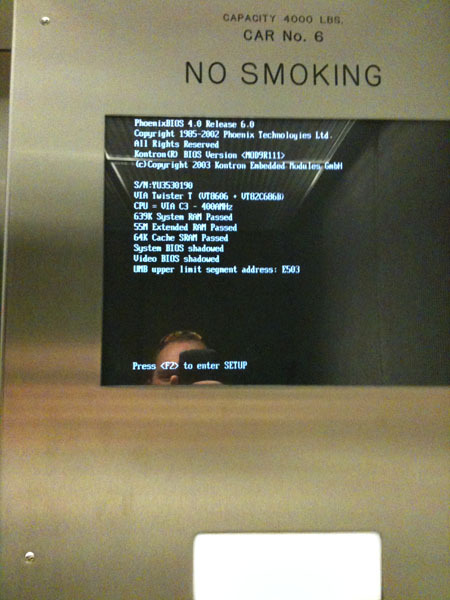 Would you get on this elevator? The display was locked-up mid-boot and never did recover during my short trip from the 4th to 1st floor. Everything went well, but wow. 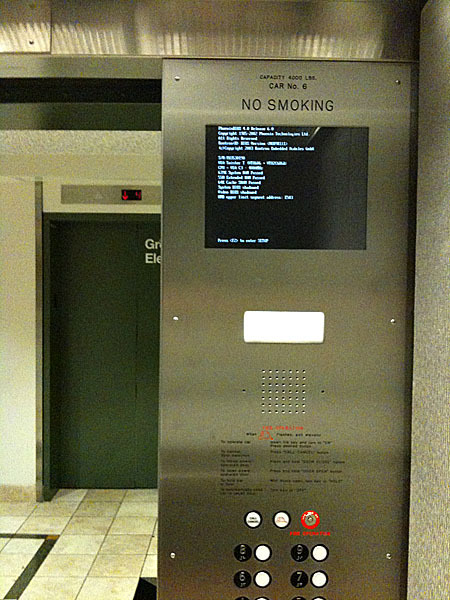 This brought up the importance of how it is often it’s the *subtle* clues software needs to be giving off that show that things are working ok and the software is built with enough quality to handle many eventualities to the level we feel confident enough for our important data (or in the case of this elevator – our very lives). Interfaces that lock up after you hit a button, spinning disks that don’t give you any clue how long they’ll take to come back, or dialogs that have confusing wording are all things that make you start to feel un-trusting of the software and start thinking it is glitchy or low-quality. People feel good about software/something’s usability when they get a “chain of victories” – when a tiny chain of perfectly timed events/accomplishments go off right. That’s what makes people enjoy using your software and perceive it has value and was well designed. Know the point of usability testing: You only need about 2-5 people to test your usability. More people than that, and you’ll see same stuff again and again. You don’t want numbers/stats like ‘27.5% of the people found the save dialog box’. You want to know what users think should happen – so the thing you’re looking for are things like “Most of the users kept opening the file menu to find the save feature – but it wasn’t there”. The point is to teach you how people *think* the interface should work. If you just outsource this and get a stack of numbers back, it’s like paying someone to go to college for you. You are not learning how the average person approaches the visual clues on a computer. Affordances are visual clues. Use negative space to show where hand or finger goes like they do on camera bodies, put ridges on window edges to show it can be sized/slid. Make tabs act like real file folders so they click and show new panes, etc. Windows briefcase was totally confusing since didn’t work like real briefcase. Do I put things in it then copy that to my pen drive to take it home? Also, always obey the laws of physics – windows tabs dragging things should behave as on a real desk. Don’t rely on the user knowing about strange ‘hidden’ panes or the like when switching between things (early versions of Mac Office did this). Don’t break people’s expectations of how something works if you use a visual metaphor. If you’re using it, it should be because it’s a GOOD metaphor. Certain hot-key combos and other UI behaviors had better be the same as other apps or people will get frustrated. Even if you hate the way Microsoft/Apple did it – different or ‘clever’ new UI or key shortcuts for cut/paste and other common features will just anger 99.999% of the people (yes – this means you Linux). If you’re going to do it differently, you better understand exactly why and that most people will probably TRY to do it the old way; so be ready for that. 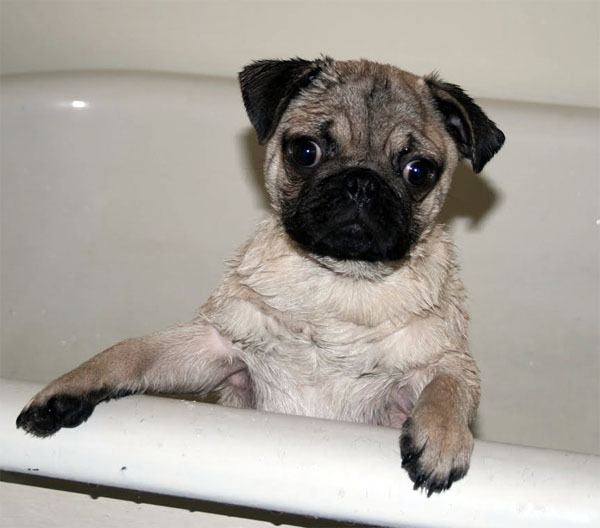 If you design your product for difficult/extreme cases – it should become even easier for normal use. Design for people who are colorblind, for low light, shaky hands, wearigng gloves, etc. RFID cards for hotels were designed for folks that had poor vision/arthritis, but turned out way easier than standard house keys for buildings and are used all the time. People now just put coat pockets up to the the sensor when their hands are full – much easier. Designers started designing large handled kitchen tools for people with arthritis; and then it turned out everyone actually preferred them – now almost all modern utensils have large handholds with nice grips and large knobs. Your UI should never rely on color for functionality. A good number of people are partly colorblind – so if you design in B/W, it will help you create affordances that will likely help everyone – i.e. pie charts that have labels that float over each slice instead of just in a color key to the side with many different colors that are very close in shade. For computers – design for people that can’t: read, use mouse well, or have memory so bad that can’t remember own name if it wasn’t on a card. This is the right way to design for usability that turns out good for everyone – and not condescending like the ‘clippy’ assistant was. Assume everyone is using your app with a crappy laptop trackpad or clip-on trackball attached to their laptop. Listboxes should expand to whole physical page or max elements – don’t make them scroll if at all possible. Dropdowns should happen if you click ANYWHERE in dropdowns box – not just the down arrow. Always autoscroll down when near bottom of page. Use bold, fat fonts so characters are wide & selectable like Macs that use Chicago font. No characters should be 1 pix wide like if you use Arial. Coders think that if you allow something between the range of values, that any value in that range is equally likely. This is usually wrong and leads to inefficiency. i.e. If the range of 0 to 100 is allowed, 50 is probably more likely than someone choosing 47. If you allow window repositioning, odds are most of time folks will want windows in certain spots – like right against edge, not exactly 2px from edge. Or if a window is inside another window – should you really allow sub windows to go past edge? Snap too or have elements go to the most *likely* values/positions. Photoshop has a snap to edge/nearest ‘edge’-like feature of the picture ability. Menus give lists of commands so you don’t have to remember individual commands like the old Emacs days. Always try to allow folks to chose from lists of things instead of having to remember. Give other context hints: thumbnails show what the contents of a file is, autocomplete helps finish words. All little helps are good – but don’t go overboard – allow easy outs or pass arounds for your ‘helping’ or folks will get frustrated. If you fail to guess right 2-3 times, auto-disable the feature. Photoshop’s snap-to feature is easily disabled in the menu bar, or just hold down ALT to get rid of it for that operation. Don’t design by listing features you want – start with list of activities you want to accomplish. What activities do you want to complete with your software? This is especially true for version 2.0 of your app. See what people ACTUALLY use it for and optimize for those activities. Turns out many people use Excel to make simple lists – which killed competitors when they optimized for other activities. You take weeks to design the dialog boxes and flow – thinking long and hard about it – but the user sees it and needs to make a choice in 5 seconds. They see so many options – they don’t know what to do. i.e. a complex print dialog box that has so many options and parameters nobody knows WHAT to do with all the buttons/options. Solution is to take a printout of the dialog to conference room and ask 3 people what they would do if they saw it. Over the course of the 6mo to 2 years you develop things, you come up with more and more ideas. While you learned them over months and years, your user will experience them in just a minute or two. The best designs are the simplest – like a toaster. If a software design team built a toaster, it’d end up costing $1200, make toast, BLT’s, have lcd displays, and boot up and ask if you want to register for AOL before you could make a single slice of toast – and it probably wouldn’t even do that right the first go. VCR designers kept adding more features until they realized what people really needed was if you put a tape in, it should automatically switch to the VCR mode of the TV/VCR setting, and actually start playing right away, then auto rewind when it hit the end of the tape. Seconds feel like hours when you get no immediate response back. After about 2.7 sec, people get bored/give up. So when you click on something – always do SOMETHING, never just sit there blankly while you work. Turn cursor to hourglass, progress bar immediately appears, etc. try to break up long operations when it makes sense. Instead of waiting for VB to compile all at once when you hit F7, do the parsing after each enter for a half-second, so compiling was fast. When that fails, bunch all long operations TOGETHER so you ask all the questions up front, then tell them to go get a coffee and when they return – it will be done. NEVER pop up a dialog half-way through that pauses the long action so they’re stuck at the machine for the whole time. Basic takeaway: Over the time you design a package, you should be removing complications, not adding them. Don’t confuse usability with learnability – Figure out if you need learnability or usability in your app. If the user is going to use it once or twice (like a map kiosk) they need high learnability. If it’s something they use every day – it needs to be very usable. Hopefully a usable program is learnable so that the user can figure things out on their own. This means it might not necessarily be that it’s easiest on the first go – but should act the way the expect the first time. Attended an all-female circus on Friday night. It was quite good. The circus is actually put on by a school that teaches (believe any gender) folks how to do amazing acrobatic feats in a converted warehouse. This particular show consisted only of women and girls who were of all skill levels. Everything from musicians playing on stilts to amazingly acrobatic straps and trapeze. Sarah Vowell reads from her new book. I ended up choosing the Star Wars concert because it was earlier (and I was tired that day), and scored tickets at the last minute for super-cheap. The show had a full orchestra playing the music, while scenes from all the movies was shown. My friends did the Surfers concert and much fun was had there too. The Star Wars show was live narrated by the character that did the acting and voice for C3P0. Overally, very well done show and I was super-happy I went. Was amazed at how many kids went and seemed to have a great time. If I’d had kids, I would have loved to take them as well. The foyer of the Rose Garden was full of original props from the movies: Original Darth Vader costume, Chewbaca, helmets, weapons, and an original score written and signed by John Williams. I love the shows these guys put on. I must admit that I liked the Sultan’s Elephant much better; but apparently they were so sick of cities asking for them to come and do that show that they actually destroyed the elephant so everybody would stop asking. Anyway, here was there germany show about a diver trying to find his daughter. The shows are fantastic because they go on over DAYS of action. At night the marionettes fall asleep with mechanical breathing, they change clothes during the show, walk through the cities, etc. Amazing. I still remember in my college psychology class when a life moment hit me. The professor asked a very simple question: “If money was no object and you could go anywhere in the world – write down 5 places you want to go.” His example was trying to prove a different point, but what struck me was that up until that point in my life growing up relatively poor in rural Indiana – I hadn’t really ever considered that I could make such a list. It floored me. As a college graduate, I would actually get to make a list like this and possibly even see it realized. So, I present the question to you. Where are 5 places you would go if money were no object? Spend a week or so in a stilt hut over azure, clear-blue water on a tropical French Polynesian island reading, resting, and drinking umbrella drinks. Like Tahiti, Bora-Bora, or Moorea for instance. Take a camping/hiking photography tour of the Island of Skye’s amazing landscape. One of the poles – either Australia with a side trip to either the South Pole. Or, travel above the Arctic circle to the North Pole. Today numbers show that the recovery is ‘softer’ than thought. And it’s not surprising why. In fact, I predict it will ‘soften’ yet again in two months. Why do I predict so? 1. Cash for clunkers ends – and the ‘recovery’ for automakers ends. Shock and awe – when the cash for clunkers program ended – all of a sudden people stopped buying cars and that auto ‘recovery’ seems to have stopped. Well DUH! It wasn’t really a recovery ANYWAY. it was an artificial recovery. Yet people seem surprised that folks stopped buying new cars after it ended and are punishing their stocks. Who honestly didn’t see that’s what would happen. Here’s my prediction portion. Yes, home sales have had nicely improving numbers for the last several months of sales. But that will stop Dec 1, 2009 when the cut-off for the $8000 first-time buyer program ends. Then, probably just like the cash for clunkers – we’ll see slowing sales again and that ‘recovery’ will go soft – and will probably ‘shock’ experts just like the slowing auto ‘recovery’ did. With unemployment continuing to rise, and along with that the number of forclosures continuing to rise, it’s foolish to think the rising house sales trend will continue. Oh, it won’t crash, but don’t expect a roaring recovery when there aren’t new jobs so people can pay those mortgages.